401 and up were probably used by the Virgina plant. The T-23 (1974) has an all-wood interior, including bulkheads, sole, cabinets (sink and stove), forward vee and settees; mostly plywood. 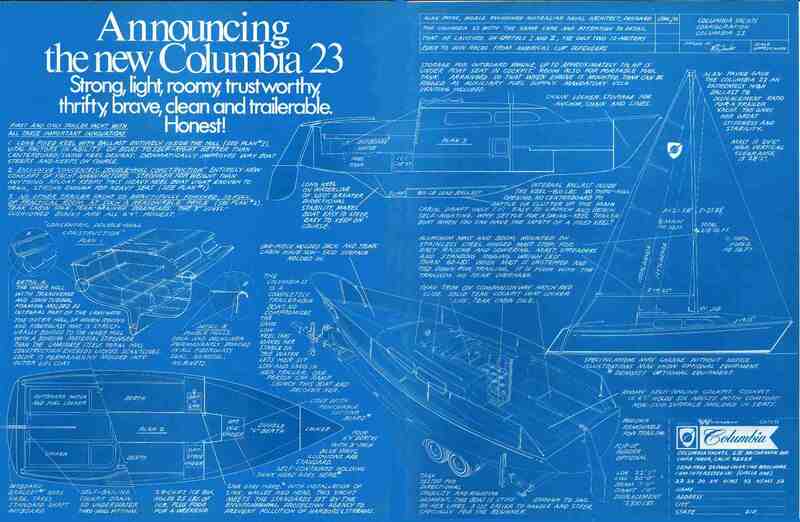 Advertisement introducing the Columbia 23. Sail Area 218 sq. ft.
A common question is "what happened to the molds?" It seems the T-23 keeps coming back. Justin Thompson of Marine Info and Design discovered the Charger 23 built by Charger, Inc./Playmate Pontoon Boat Company in 1982 and 1983. Sailboat Trader - Florida Edition - July 31/98, page A80. 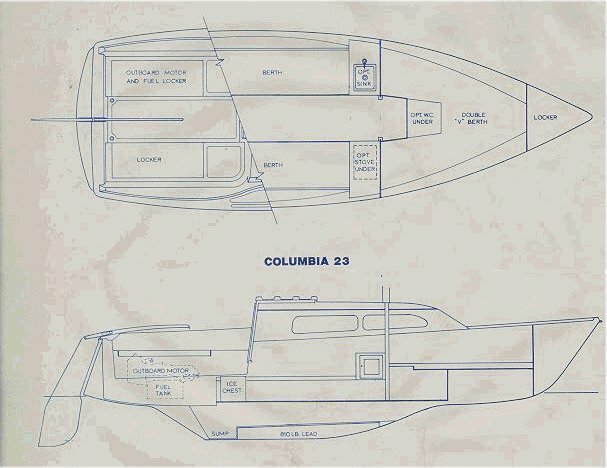 "SAILBOAT MOLDS, DRASTIC PRICE REDUCTION must sell now, 23' former Columbia shoal draft, complete set of sailboat molds, includes production plan, directions, manuals, sail plan, hardware plan, etc., complete with 3 axle transport trailer to move everything to your facility. Price is slashed to move quickly, $1800, Ocala, 888-922-3663 toll free"
On our previous Columbia T23, there were two drains in the aft end of the cockpit that were plumbed through the transom. The trouble was that they were below the waterline when the boat heeled, and the cockpit would start to fill (rapidly!). Boy, did we get the wide eyed looks from friends who didn't realize what was going on! They thought it was time to grab a life best and look for higher ground!! Bill Pinksten owner of Summer Dawn, hull 383, says that you can get replacement rubrail from Hamilton Marine. He says that the rail is a soft PVC channel which snaps over a rigid plastic T channel, which in turn is screw fastened over the outturned hull and deck flanges. Contact Hamilton Marine, 100 Fore Street, Portland, ME 04101, tel. 207-774-1772, (www.hamiltonmarine.com). They have exact replacements for it and will send a small sample for test fitting if requested. For the 23T the model number is DWP-232-FW for the soft outer channel and DWP-233-R for the rigid inner T channel. The soft outer channel is also available in black. The have good service with reasonable prices and a wide variety of other rub rail sections. Strange Story of a Rescue at Sea.